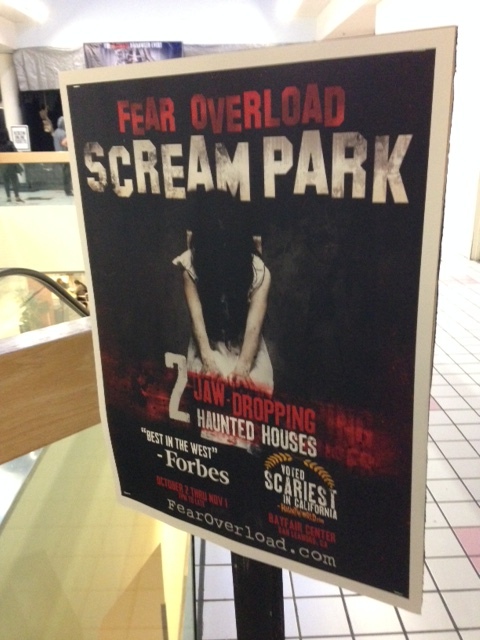 Located in the Bayfair Center Mall in San Leandro, Fear Overload’s “Scream Park” boasts two chilling haunted attractions for 2015 Halloween season. Titled “Hostel: Tenderloin District” and “7 Deadly Sins,” the two haunts are intended for mature audiences and require visitors to walk through one gruesome scene after another with only the aid of a cheap flashlight to guide them. The attractions are consecutive—meaning you walk out of one and right into the other—and you are encouraged to take your time as you explore each scene and unveil the macabre horrors that await. Unlike in other haunts, you will most likely not bump into the visitors in front of you, giving you and your friends a rare opportunity to really soak up every bloody drop. 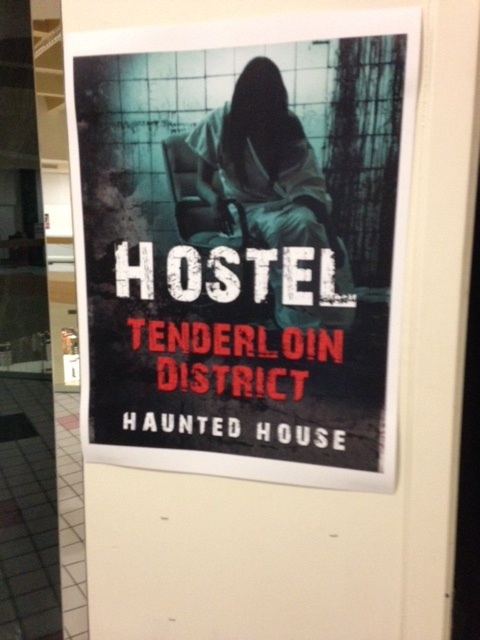 Of the two, “Hostel: Tenderloin District” is the stand-out. Pulling no punches when it comes to gore, nearly every scene features either a rotting corpse, severed torsos and limbs, blood-spattered walls, and deranged killers and mutants of some kind. Live actors spring from darkened corners to terrify you; others crawl along the floor and hiss their poisonous words through clenched teeth. In one scene, a woman can be seen gnawing on the remains of her victim’s gutted belly, a ghastly sight made all the more horrifying by the dwindling glow of your flashlight. The “hostel” theme works perfectly here as you move hesitantly through each creaking door, never knowing (or trusting) what will appear in the next set of murder rooms. My only complaint about San Leandro’s “Scream Park” is the re-use of some of the same set-pieces from previous years. I attended this haunt in October 2014 when the theme was “Zodiac” (based on the famous Zodiac murders of San Francisco); and in December 2014 when the ghoulish crew put on a Christmas-inspired holiday haunt. In all three of my visits, I noticed identical back-drops and imagery, so for a haunt veteran like myself, this was a slight disappointment. That said, I love that Fear Overload’s “Scream Park” is not for kids; it’s bloody, gory, scary, with dedicated actors and psychological and psychosexual motifs throughout. In other words—money and time well spent. Highly recommended. You can learn more about this attraction and buy tickets here.